This week I'll have a couple of Free GM Resources to make up for an unexpected lack of content the last couple of weeks cause by me not being as prepared for a business trip as I should have been. Speaking of "lessons learned" my very 1st thoughts/attempts at this Frugal GM thing go back more than a decade to the 2008 Origins Game Fair. A GM buddy of mine agreed to co-chair a small workshop about Learning to GM. As you might expect, the workshop was free and together the two of us covered a wide array of topics, from finding players to at-the-table tips, and how to work around a variety of issues (time, weight, money & ideas.....sound familiar?). Included in the workshop were some freebies, including a disc full of files and links. There was a distinct focus on HackMaster 4th edition, but there would be a large carry-over to AD&D 1st/2nd Edition and to an extent D&D as well. We both new the majority of attendees would come from the HackMaster community since the other GM and I were big volunteers for KenzerCo's HackPack. There are a mix of files on here and links that will undoubtedly be dead more than a decade later, but everything here was either created by me (I cannot recall if the other GM contributed to the disk) or was given freely by the perspective creators. I did, at the time, make sure that links were provided to the content creators, but you may have to do some sleuthing to see if they still have a web presence. 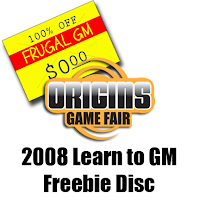 2008 Learn to GM Freebie Disc (Dropbox Link). I'm pretty sure the disc was all you. I can't remember contributing directly to it.